Long considered a trusted partner by parents for providing a way to bring healthy food and drink options for kids on the go, Genuine Thermos Brand has brought its superior insulation technology to FOOGO, a line of children's products for ages six months and older. Freshness and safety go hand in hand. If contents are not kept at the right temperature, potentially dangerous bacteria may grow rapidly and cause food and beverages to spoil. All FOOGO stainless steel products feature THERMOS vacuum insulation technology which has been shown to inhibit the growth of bacteria in a laboratory test sponsored by Thermos and performed by Cornell University. For additional peace of mind, FOOGO products use BPA-free materials. FOOGO products are offered in three styles that are designed to grow with your child. Soft spout sippy cups with handles are for children 6 months and older, hard spout sippy cups are for children 12 months and older, and straw bottles are for children ages 18 months and older. The FOOGO Stainless Steel Straw Bottle makes it easy to keep drinks cold on the go. This bottle has a 10-ounce capacity and features THERMOS vacuum insulation technology to keep contents cold for up to 12 hours. The contoured shape of this bottle is easy for little toddler hands to grip and hold. The FOOGO straw bottle is a great choice for a child's first real straw bottle. Unlike other straw bottles, the FOOGO straw bottle can be used to teach kids to drink from a real straw, without built-in valves that inhibit flow. Thanks to the durable double wall stainless steel construction and vacuum insulation, this FOOGO straw bottle will not gather condensation or leave water rings. A hygienic push button lid is simple to open and reveals a pop-up silicone straw that is comfortable to drink from. Cleaning is simple, just unscrew the lid and the straw can be completely removed and disassembled to two parts for easy cleaning. The bottle and straw parts are top-rack dishwasher safe, however, hand washing is recommended for best results. Not for use with hot liquids. 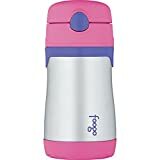 Interested in the Thermos Foogo Vacuum Insulated Stainless Steel 10-Ounce Straw Bottle, Pink/Purple? Is the price too high? You can easily price watch this product and we'll notify you when the price reaches your target.